Model JC20 takes the oilless category to the next level. 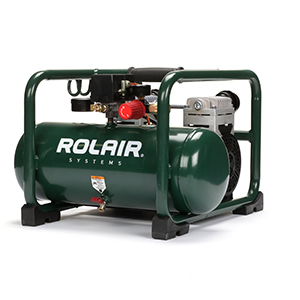 Capable of delivering 4.5 CFM @ 90 PSI, this quiet, 2 horsepower electric air compressor is perfect for light duty framing and roofing work. The JC20 utilizes a two-cylinder pump powered by a 1700 RPM low-amp draw motor for maximum efficiency. Additional features include a heavy-duty roll-cage, integrated cord wrap, upward-facing gauges and a quarter-turn drain valve. Super Quiet, ROLAIR Quality, Single Stage, Oil-Less, Two Cylinder, Ball Bearings, Cast-Aluminum Cylinder, Stainless-Steel Reed Valves, Low RPM for Quiet Operation - ONLY 70 dB!! Decibel Level - ONLY 70 dB!! L x W x H 20"x20"x15"